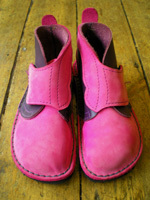 Chuckle Shoes are a long established shoemaker offering bespoke adult and children's shoes, boots and sandals, all handmade from natural leather & crepe rubber and synthetic vegan materials at our workshop in Exeter. The quality of our shoes has made us a popular choice for customers from all parts of the UK, and our craftsmanship has earned us a loyal customer base. 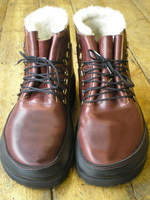 Our expert shoemaking techniques allow us to provide greater comfort for everybody and especially people suffering a variety of foot problems. From the initial biomechanical assessment of the feet to the high quality stitching, every aspect of our shoe production is carried out with the greatest precision, making the finished product both very comfortable and hard wearing. 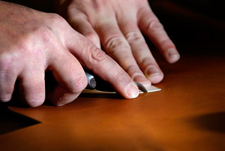 To demonstrate our faith in our own product we will happily, if required, repair stitching free of charge. 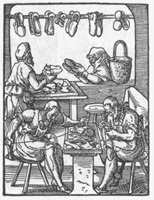 Shoemaking is one of mankind's oldest and most essential skilled trades. 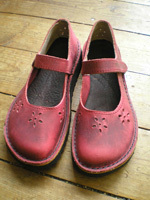 For over 30 years the craftsmen and women at Chuckle Shoes have been proud to consistantly design and create stylish and comfortable footwear for feet of all ages, shapes and sizes. 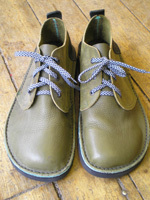 Using a combination of traditional and modern techniques and both natural and especially formulated synthetic materials our dedicated and knowledgeable staff produce a range of handmade shoes designed around the actual functionality of the human foot. This not only makes for happy feet but promotes better overall health through improved posture while at the same time allowing for a huge choice of style and colour. 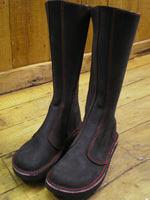 We utilise correct UK standard sizes and shapes in the construction of our off the shelf shoes (unlike most mass-produced footwear), however our preference, where possible, is to begin the shoe making process by measuring the length and girth of the customer's feet and taking drawings and notes of the shape we are seeking to accommodate. We can then combine a variety of standard and bespoke components as appropriate to create the perfect fit. The component parts of the upper are cut (or "clicked") from the chosen materials. These may include the quarters (sides), vamp (top/front), trims, straps etc. which we then stitch together by hand. The appropriate shape is stamped from one of a variety of soling materials - natural crepe rubber or textured Vibram and hand finished as necessary. 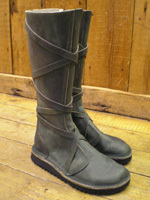 A "runner" is stitched to the bottom of the upper enabling it to then be glued to the sole. The shoe is then steamed to make it supple and a correctly sized foot shaped "last" inserted before leaving for 24-72 hours to give the shoe its final shape. 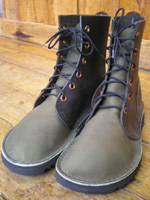 During this time the edges of the sole may be buffed and the upper polished to give a final finish. During these stages alterations such as insoles, strengtheners, cutaways or spot stretching may be utilised to create a comfortable and healthy fit for the individual foot concerned. 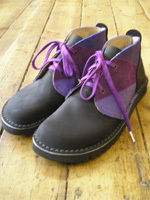 One of the many advantages of the handmade shoe process is that we can provide a bespoke shoe making service. You can indulge your own creativity by choosing style, colors, materials and details such as trims, fastenings or stitching. Personalised made to measure production ensures that the shoes you purchase from us are not just made for feet - they are made for your feet and enables us to accommodate a wide variety of foot problems. Visit our problem feet page for further information regarding how we can help you.